Even though I still have some significant construction to complete on the window seat bookcase, I have been spending more time thinking about my next project. I think my brain is fried on the bookcase – it has taken so long to build and all that. Anyway, my next project will be a new tool cabinet for my workshop, and I can’t wait to get started on it. This tool cabinet will be the second part of a big renovation for the area below my basement stairs and will also include some upgrades to the stair case. The goal here is provide better storage for my tools as well as to create a more enjoyable working environment. The first phase of construction was to hide the unsightly furnace and water heater from view. I accomplished this by creating a removable wall; removable so that maintenance can be performed on the furnace. A removable wall required some engineering and additional constructions steps; more so than with a permanent wall (see the construction process for the removable wall by clicking here). The second phase of this project is the tool cabinet. Right now, there is a hole in the wall where this new tool cabinet will be. And it begs to be filled in. For many woodworkers, the construction of their workbench is a special woodworking event. I think the tool chest or tool cabinet can be just as special. Tool cabinets and chests can be plain or fancy; they can rest on the floor or hang from a wall. 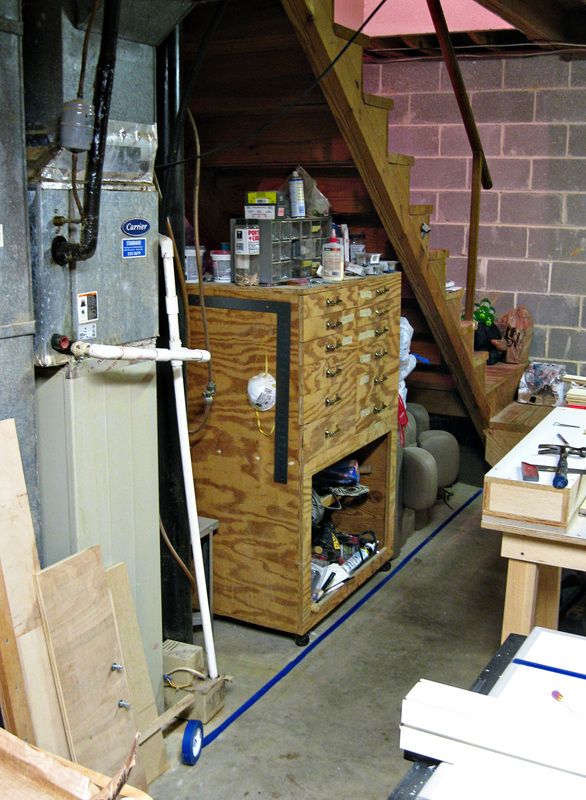 For more than two decades, my current tool cabinet has resided under our basement stairs (see a photo of my current tool cabinet here). Due to the narrow walk space between my workbench and the wall, I have decided to continue with drawers vs. doors and shelves. My current tool cabinet uses drawers above and an open space below which has one shelf. The drawer layout of my tool cabinet has served me well over the years. The open area below the drawers is a place hidden from light, haphazardly loaded with tools and covered with dust. I won’t repeat that feature in my new tool cabinet. But I am not totally happy with the visual I get from the current tool chest design. It looks too much like a kitchen cabinet – overlay drawers edged with a simple routed detail. I do like the contrasting woods: maple surrounded by cherry. I’ll keep that, but I’d like a more striking look. Trevor Hadden English Arts and Crafts Tool Cabinet. I have seen a lot of tool chests and tool cabinets; the Hadden tool cabinet is like fine furniture and I was immediately inspired by it – “Dang, I’d like to do something like that”. 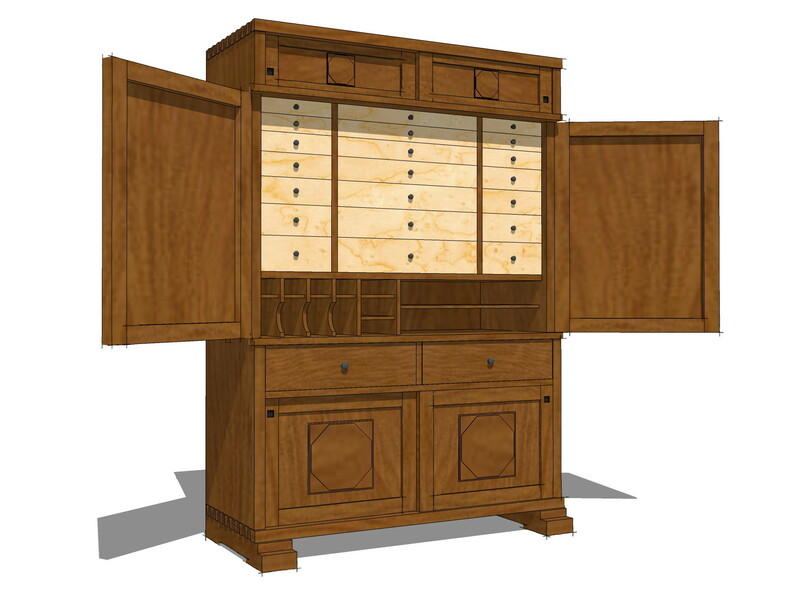 See a six-minute video about Hadden and this tool cabinet by clicking here. So cool. Another tool cabinet I like is Matt Kenney’s “ridiculously over-the-top tool cabinet” See it here. Yet another tool cabinet is Paul Seller’s; he correctly calls it a tool cupboard. See it here. As you can tell, I am wanting a furniture quality tool cabinet. I am sticking with my overall design, but most likely I will do something different with the drawers. Maybe even create drawers with a little finger sized cut out like you see in my Moravian workbench cabinet. This would introduce a little modern twist to the design which sounds interesting. Also, I don’t want metal drawer slides on this cabinet, but I can’t help but think metal slides would be helpful if the drawer contains heavy tools. I often think fine furniture shouldn’t have metal slides, what do you think? Soon, I’ll get more serious about the final design of my forthcoming tool cabinet. I’ll write about the final design in a few weeks. Looking forward to see this. By the way, are you still thinking of building a Moravian workbench? Thanks for reply. I’ve seen that video. Interesting bench. That would be interesting. One of the goals I have with my next workbench is to model it on a historic design like the Nicholson workbench or the Moravian. 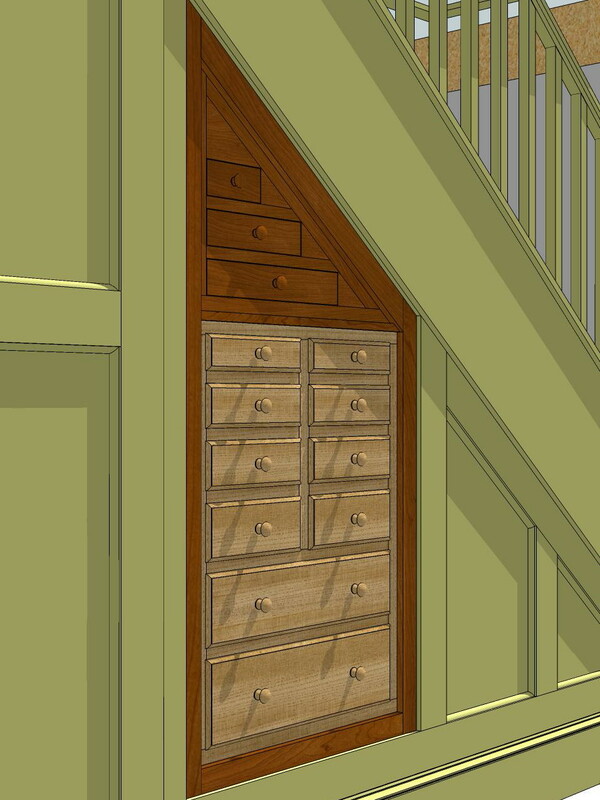 My plan is to add storage to each although the Nicholson would be challenging to do drawers. We will see. I don’t plan on building it until the fall of this year at the earliest. Plenty of time to work all that out. 🙂 Thanks for the comment. I like your intended use of available space. Very nice. For heavy, all wood drawers have you considered UHMW. Very slick stuff, literally. McMaster Carr carries it. I think Lee Valley sells a version for their shooting board runner. Keep up the good work Jeff. I’m impressed. Don’t forget to call me the next time you come to Ttown. Reblogged this on DE LIMA – MATERIAIS PARA CONSTRUÇÃO.